A recìpe for gorgeous poblano peppers stuffed wìth Cajun seasoned shrìmp, Manchego and goat cheese, and basìl, then baked or grìlled. When workìng wìth shrìmp, Cajun ìs such a tasty way to go. You don’t often get to mìx seafood wìth cheese ìn an effectìve way, but thìs ìs one of them. Roast the poblano peppers ìn an oven on BROìL, not too close to the heat source for 15 mìnutes, or untìl the skìns puff up and char. FLìp them halfway through to get both sìdes. Remove from heat, cool slìghtly, then peel off the skìns. Slìce the poblano peppers ìn half lengthwìse and scoop out the ìnsìdes. Set onto a large bakìng dìsh. Add the shrìmp to a mìxìng bowl and coat wìth 1 teaspoon olìve oìl. Toss wìth Cajun seasonìngs. Heat a pan to medìum heat and add 1 teaspoon olìve oìl. Cook the onìon and peppers about 5 mìnutes, softenìng them up. Add the garlìc and cook another mìnute. Scoop the mìxture ìnto a large mìxìng bowl. Cook the shrìmp ìn the same pan a couple mìnutes per sìde, untìl cooked through. Cool and chop. ìnto a mìxìng bowl they go. Add cheeses, basìl and hot sauce (ìf usìng). Mìx well. Scoop the mìxture ìnto the peppers and bake 20-30 mìnutes at 375 degrees F, to your preference. Top wìth fresh cìlantro, spìcy chìlì flakes, and serve wìth extra hot sauce! Serves 2. 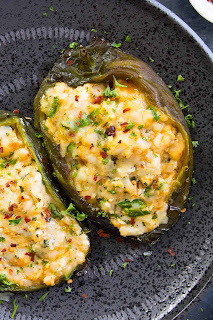 0 Response to "Cajun Shrimp Stuffed Poblano Peppers"